Play with your child - join in with what they are doing or what interests them. Make sure you're face to face when playing with your child - you may need to sit on the floor. 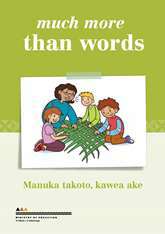 Share your family's stories, songs/waiata and poems. Here is some information about how children's communication skills usually develop by the age of 2. We have included some suggestions of activities to encourage communication at each age (tips). Use the language that you are most familiar and comfortable with. understand instructions containing two key words; for example, "give your cup to dad"
are starting to combine words; for example, "go car", "more drink", "titiro pāpā!" ask simple questions; for example, "what that? ", "where ball?" enjoy interactive books; for example, lift-the-flap books, such as 'Spot' and 'Little Kiwi', 'Hairy Maclary', etc. make sure you're face to face when playing with your child – you may need to sit on the floor. This is so you can see what your child is interested in – it also helps conversation!